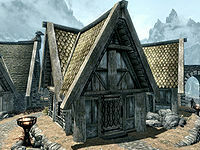 Amren's House is a residence in the Wind District of Whiterun, located next to Uthgerd's House and across from the House of Clan Battle-Born. It is the home of Amren, his wife Saffir, and their daughter Braith. Entering leads directly into a large room with a round wooden table and a couple of chairs with a bottle of wine, bread, and cheese on top of the table. Beside this is a flight of wooden stairs against the northeast wall leading up to a partially-floored upper floor. On your right is a cupboard, a fish barrel, and a food sack. On the cupboard's shelves are three bottles of Nord mead and a goat cheese wheel. If you have already completed the quest to recover Amren's sword, this will also be found on a shelf. On top of the cupboard is a bottle of wine and loaf of bread, while on the fish barrel is a bowl containing a cabbage. Under the stairs are more food sacks and a barrel, and in the eastern corner of the room is a small table and chairs with a bottle of wine and sliced eidar cheese on top. Above the table are three garlic braids and four bunches of dried elves ear hanging from a rack. In the middle of the southeast wall is a large fireplace with a cooking pot on a stand in front and a bottle of wine on the mantelpiece. Coming out from the middle of the southwest wall is a large double bed with an end table to the left holding a copy of Nords Arise! To the right of the bed is a dresser containing fine and common clothes, with a bunch of tundra cotton and a food sack on top. Climbing the stairs leads to Braith's sleeping area, with a single bed at the end, an end table to the right, and an unlocked chest containing leveled items at the foot of the bed. On the end table is a copy of The Holds of Skyrim. The front door has a novice lock, the key to which is carried by Amren and Saffir. There is a "Danger" shadowmark to the left of the door near the ground due to Amren's high proficiency using one-handed weapons. After returning Amren's family sword, all low level items in the house become free to take, and both beds become usable. This page was last modified on 4 September 2018, at 00:15.